The new report by Zion Market Research on the “Roof Safety and Access System Market by Product Type (Guardrails, Fall Arrest Equipment, Skylight Screens, Roof Anchor, Portable Safety Railing, Horizontal Lifeline, and Hatch System); For Application (Residential and Non-Residential): Global Industry Analysis, Size, Share, Growth, Trends, and Forecast 2016 – 2024" has a vast information about the market and its potential. The global roof safety and access system market was valued at around USD 1,300 million in the year 2016 and it is expected to reach approximately USD 2,300 million by 2024. The global roof safety and access system market is expected to exhibit a CAGR of more than 7.5% between 2017 and 2024. The increasing implementation of the stringent regulations is one of the major factors that drive the growth of the global roof safety and access system market. In major developed countries, strict regulations concerning safety are being implemented in the construction sectors owing to which the sales of the roof safety and access systems will grow in the future years. Our research analysts observed that there will be an increasing demand for the roof safety and access system market from the non-residential sector. The global roof safety and access system market is segmented on the basis of the product type, application, and the geographical regions. There are several types of safety products and systems used in the roof safety for ensuring the safety of the people. In case of workers and personnel working at rooftops and vertical heights requirement for the safety products are prominent. Among the products that are used for the safety purposes, horizontal lifeline contributes a major share in the market growth owing to its vital role. Horizontal lifeline is the most widely used product in roof safety and access systems as it provides continuous protection to the personnel, reduces pressure on the roof in the event of a fall, accommodates corners and varying building shapes, and facilitates hands-free movement for the personnel. Rise in the constructional projects both in the commercial and the industrial sectors owing to the rapid urbanization is the major factor that is triggering the growth of the roof safety and access system market. Thus, the non-residential sector is contributing a major share in the market growth. The market is growing at a rapid rate in the developed regions. Among the regions, North America dominates the roof safety and access system market. The increase in the awareness levels regarding the safety of workers and personnel working at rooftops increases the sales of the roof safety and access system products. Hence the market is growing rapidly in the North American region. 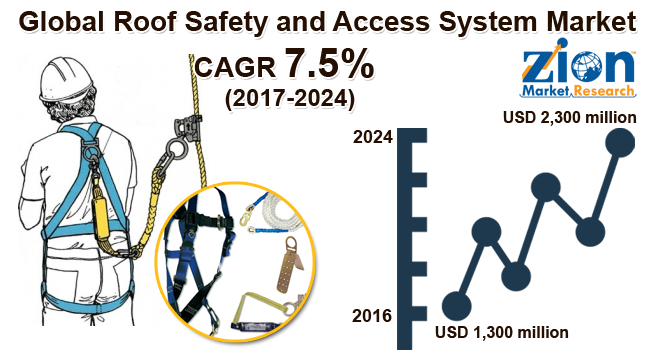 The major market players in the roof safety and access system market are 3M, Atlas Access, Bilco among others.